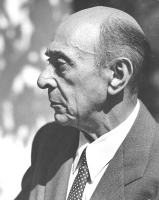 Austrian/American composer Arnold Schoenberg (1874-1951). His earlier compositions are post-romantic in character, followed by a period in which he developed his theories of atonality, music without a key or tonal centre. He has exercised very considerable influence over the course of music in the 20th century.